Bought this Wedgewood Queensware test plate to put on my wall approx 25 yrs ago in a second hand shop. I paid 5pence for it, and it’s only recently after my Brother said something about the Wedgwood plate, that I realised I might have something special. 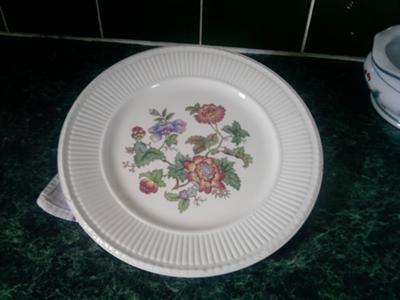 The plate is cream with a colourful flower pattern and a fluted edge. On the back it is clearly marked with (no.17 Test), it also has a no.22 lower down in smudged pink ink. It has the Wedgwood impressed mark although a little rough. Underneath the mark are (sor 8, B or R, 51 or 57 … difficult to make out). According to my brother it’s rare not nessasarily old, because apparently anything other than perfect never left the factory. Everything else had to be smashed up so it would never get into circulation. If anyone can verify this story, it’s age or the worth of a Wedgwood test plate, I would be forever grateful. The edme name is associated with the plate itself, the fluted edge and not the floral design. Can I please ask How you come to believe that to be the Wedgwood pattern name? Have you seen it somewhere else? Thank you for your latest email. Unfortunately I am not able to spend time researching into the additional query you have raised. I have no (quick) way of ascertaining as to whether or not the pattern featured on the Wedgwood test plate went into production. We have many dozens of pattern books, and the 20th century ones alone run into at least 30 earthenware books, and each pattern book can contain up to 2 or 3 hundred designs! As I work part-time, and the Wedgwood Museum Trust (which is a charitable trust and has to earn its own finances) have no staff to spare to research into such enquiries. I regret I am unable to assist you further. From the details forwarded I can advise that the Wedgwood test plate in question is made of Queens Ware (cream coloured earthenware), and is of the shape/form known as ‘Edme’. The Edme shape was originally designed by John E. Goodwin, who was Art Director at the old Etruria factory from l904 to l934. He first commenced to design the ‘Edme’ shape in l908, and the range was completed by l9l2. Such was its subsequent popularity that a wide range of items in the Edme shape including dinner ware, tea ware and ornamental items such as vases have continued to be produced from this time up to and including the present day. Edme can either be issued as a plain shape, or can be further enhanced by the addition of painted or printed enamel decoration. Unfortunately I was not able to identify the print and enamel design used on the test plate as obviously there is no pattern name or number visible. From the details of the ‘Trial’ marks on the reverse indicating ‘No 17 test’, it would seem that the plate was one of the test plates often produced by the Wedgwood (Barlaston) factory, and prior to that the Etruria Works. Often if they were testing new colours, a new pattern, or something similar they would run test plates of this type to see how colours etc., or even body mixes, reacted in the electrical fired kilns here at Barlaston. The coded date impressed mark 8B50 would indicate that this plate was made in August (the eighth month) 1950 and, as was often the practice with these Wedgwood test pieces, after they had been fully utilised for factory purposes, they were then offered for sale in the seconds warehouse to factory employees, and following this would make their way on to the secondhand market. I have asked for some further clarification for which I am still awaiting a reply. Read what I asked Below. I appreciate your input and information very much, it confirms a lot of what I guessed and more. Please can I just pick your Brain a little more. As the plate is a test plate and the pattern is like none of the others out there, chances are this pattern was never used on any other pots from the queensware Edme range that is in circulation, (Can you confirm or deny this?) What I am suggesting is, is it unique? I ask as I would like to put it up for sale and would not like to mislead anyone, of course knowing that if it was a one off it would fetch a better price. I am not asking for a valuation, I can leave that to the bidders. Though I am saving for a car. I got in touch with a Lady at the Wedgwood museum, who has asked me to send photographs and as much detail as possible, so it can be authenticated. Fingers crossed, I will know this week sometime. Will update when I have heard something. Discovered the Wedgwood Queensware test plate design name is EDME. There are numerous floral patterns similar but not the same. Also I was reading on another board a conversation about Wedgwood seconds one of the participants related that they still do smash a lot of pottery up to this day and that it was a terrible sound, so I guess she lived near by. Also it came out that in recent years they have begun to allow slight seconds out, but only very slight. I am waiting for a reply from that board, and will update here soon as, to share any info I can.